A kilogram, or just over 2 pounds, of tomatoes sits next to the 5 million "strong" bolivars needed just to buy the bunch at an informal market in a low-income neighborhood of Venezuela's capital, Caracas. 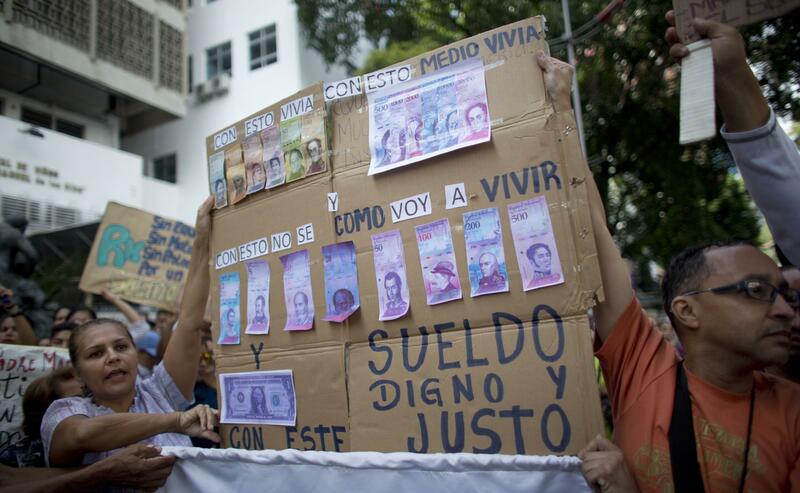 Nurses present a sign with fake currency on it, showing how badly nurses' salaries have been devalued by inflation, during anti-Maduro protests last week in Caracas. In Venezuela, where the annual inflation rate topped 60,000 percent this weekend, the currency has lost so much value that it takes stacks of bills just to buy a roll of toilet paper. The average consumer might as well bring a wheelbarrow to the market — not to transport groceries but to cart all the cash needed to buy them. So President Nicolas Maduro has come up with an audacious solution to the country's rapidly devaluing currency: Devalue it even further. A lot more. Beginning Monday, authorities are rolling out a replacement for the apparently unironically named "strong" bolivar, swapping it out for a "sovereign" bolivar that will be pegged to the government's proposed cryptocurrency, the petro. 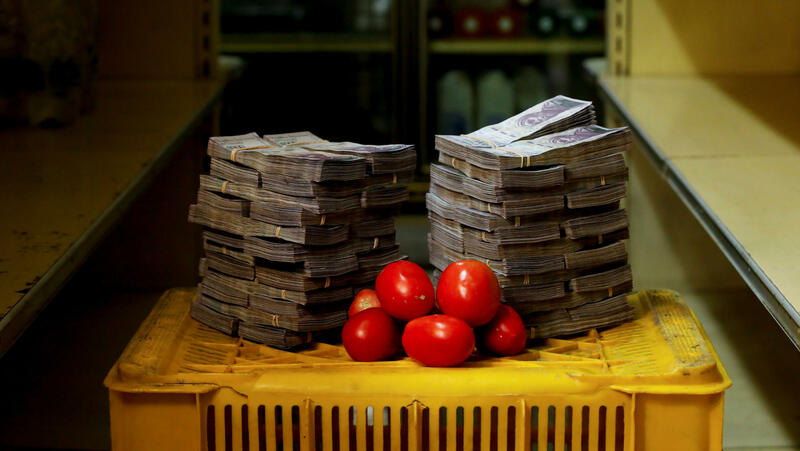 In the process they are devaluing Venezuela's physical currency more than 95 percent and radically weakening its exchange rate — going from about 250,000 to 6 million bolivars per U.S. dollar. The new banknotes are also shedding five zeroes in a bid to make matters more manageable for consumers, who presumably cannot carry backpacks bigger than themselves every time they need to do the week's grocery shopping. Paired with the currency changes are several other reforms aimed at curbing inflation and boosting the workers who have endured its yoke. In a televised announcement Friday, Maduro declared, among other things, that he would be raising the minimum wage by more than 3,000 percent and sharply raising gas prices that the oil-rich country's subsidies had long kept at a bare minimum. "I want the country to recover and I have the formula," the strongman told the country Friday, according to Reuters. "Trust me." Economists beyond Venezuela's borders have been less than inclined to trust him. "The bolivar's redenomination will be like going under the knife of one of Caracas's famed plastic surgeons. Appearances change, but, in reality, nothing changes," Steve Hanke of Johns Hopkins University and the Cato Institute wrote for Forbes over the weekend. "That's what's in store for the bolivar: a face lift." Hanke served as economic adviser for former Venezuela President Rafael Caldera, whose tenure in office directly preceded the dramatic socialist reforms undertaken by Hugo Chavez, Maduro's mentor and model. "Unless Venezuela adopts a completely new currency regime — like a currency board, or dollarization — the bolivar will face the same fate as did the Yugoslav dinar," Hanke said, referring to a currency used in Yugoslavia that was done in by massive inflation. "Hyperinflation will soar and the bolivar will more frequently come under the knife." The International Monetary Fund shares Hanke's skepticism. Last month the director of the IMF's Western Hemisphere Department, Alejandro Werner, projected that the country's currency changes and other factors will drive inflation to a staggering 1 million percent by year's end. He likened the country's woes to Zimbabwe's currency turmoil in the late 2000s and the hyperinflation in Weimar Germany in the early 1920s. It was the latter case, in which people famously had to cart their cash in wheelbarrows just to buy the simplest items, that inspired the phrase "wheelbarrow problem" — a label that has gotten lots of exercise lately in describing Venezuela's own struggles with hyperinflation. Yet Maduro is highly unlikely to accept advice from these foreign experts and officials, some of whom he has blamed for Venezuela's problems. He has said the country is the victim of an "economic war" waged by "imperialists" in general, and by the U.S. in particular. Washington has slapped Venezuela's leadership with sanctions multiple times for its failure to hold free and fair elections and the "repression and economic deprivation of the Venezuelan people." Those people, for their part, have been leaving the country in droves — with hundreds of thousands of Venezuelan nationals streaming over the border into Colombia. But among the many who have stayed, the economic reforms are viewed with a mixture of anxiety and outright resistance, according to The Associated Press. "The measures announced on Friday are not any economic recovery plan for the country," opposition leader Andres Velasquez told the news service. "On the contrary, they represent more hunger, more ruin, more poverty, more suffering, more pain, more inflation, more deterioration of the economy." Whatever the effects of the drastic changes, Venezuelans and onlookers alike will need to wait just a bit longer to see them. The country is carrying out something of a soft launch for "strong" bolivar's replacement — closing banks across the country to prepare for the "sovereign" bolivar's official rollout.